Hello, People. 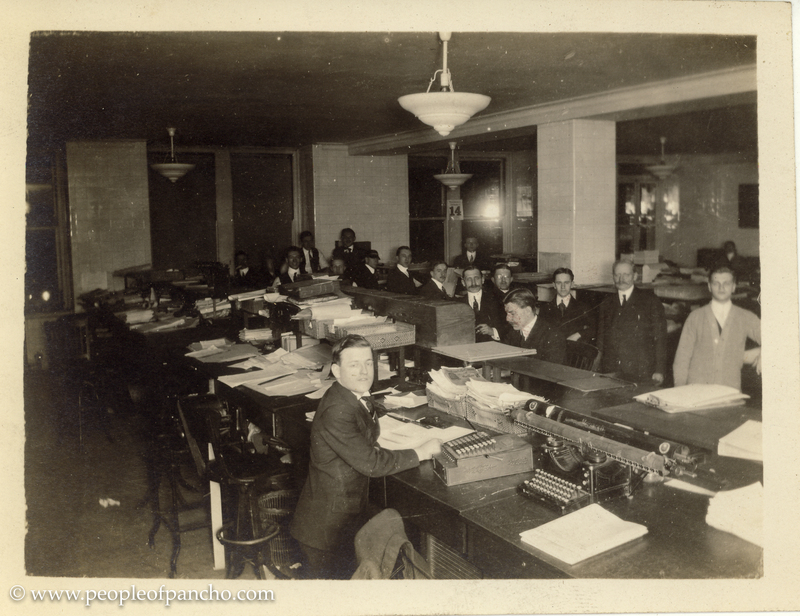 Before I move on to the next leg of the Lessiack family voyages, I thought it would be interesting to share some of the images I have of my Great-grandpa Leo at his work with the Hamburg-Amerika Line. It was his job in the accounting department of that shipping line that made so much of the fun they had traveling as a family possible. 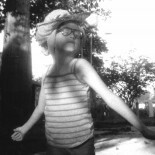 This story is not without its shadow side, however, and I must not flinch from telling it. 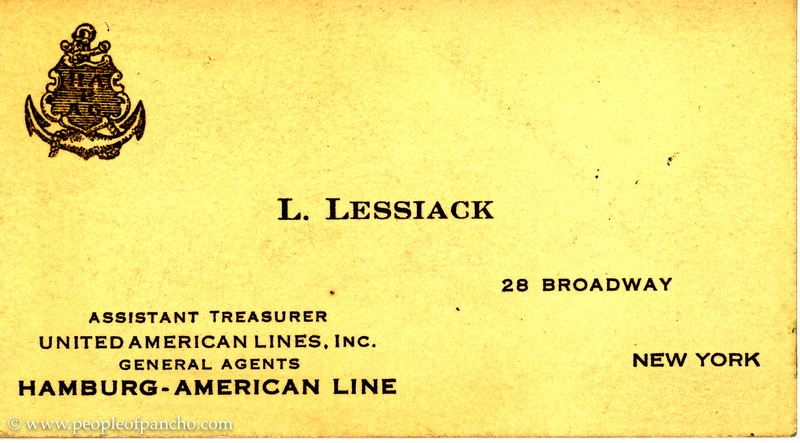 Great-grandpa Leo Lessiack’s business card, year unknown. 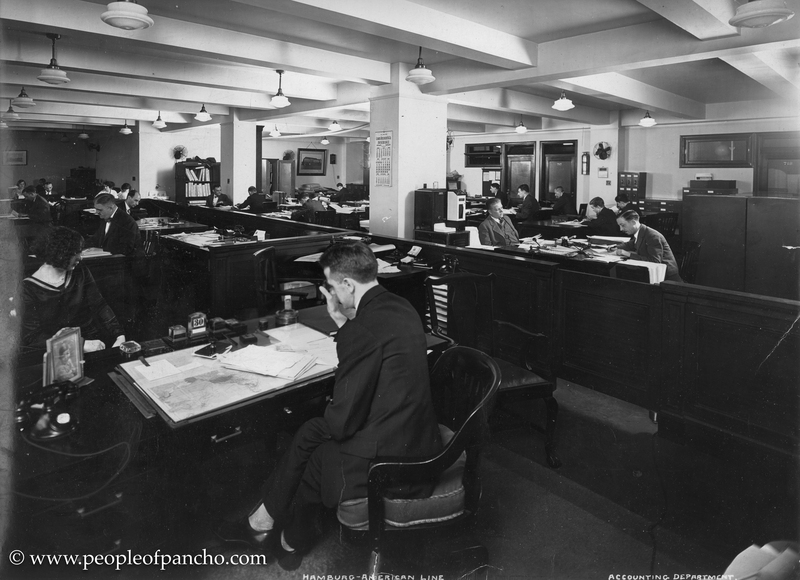 Great-grandpa Leo Lessiack at work in New York City. The calendar on the wall says 1928. He is in the immediate foreground. Photo stamped on back with the name “Herman Jaffee” who was probably the photographer. I don’t know the date of this image. Great-grandpa Leo is third from the right. In 1933, Hamburg-Amerika Line merged with Lloyd Co. under Nazi supervision. 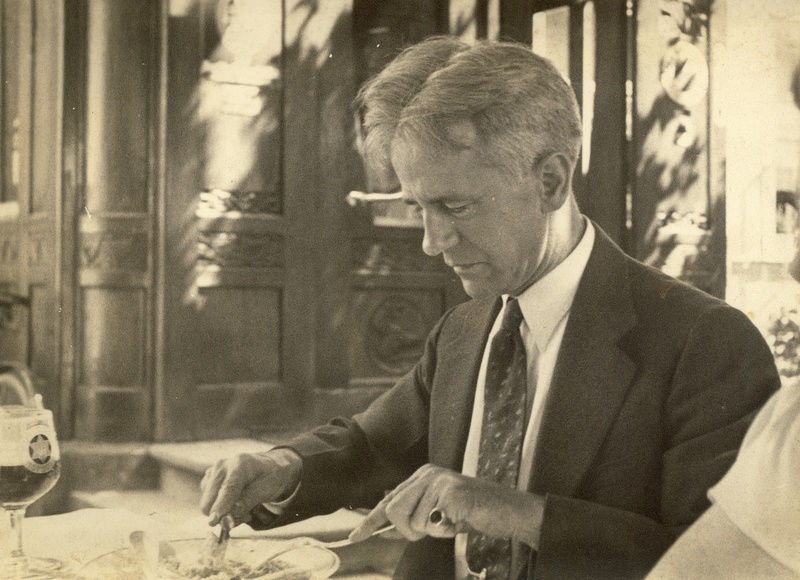 According to Max Wallace in his book The American Axis: Henry Ford, Charles Lindbergh, and the Rise of the Third Reich (Macmillan, Aug 29, 2003), a 1934 Congressional investigation found that the Hamburg-Amerika Line subsidized pro-Nazi propaganda efforts in both Germany and the United States. In August 1942, the U.S. government seized the Hamburg-Amerika Line for violating the Trading with the Enemy Act. Here is the relevant passage from the book. You’ll recognize some familiar names in there. 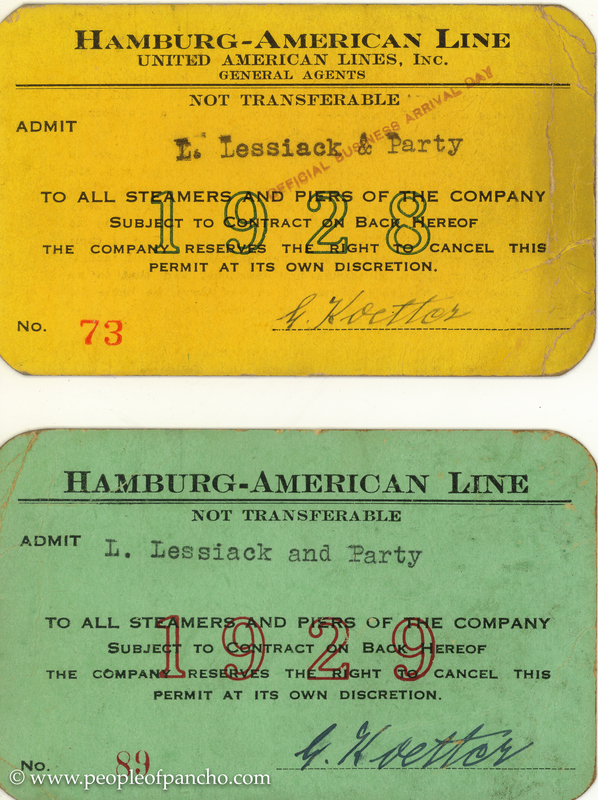 Great-grandpa Leo’s affiliation with the Hamburg-Amerika Line appears to have ended in 1939. I have no ironclad evidence for this, but 1939 is the last year for which I have his all-access pass. This is, obviously, well after the above-mentioned investigation in 1934. Yuck. Now I wonder if the note (below) that I published in my previous post was an attempt to account for his travels during this sensitive period of time. I do know that he had an absolutely terrible time finding any work in the U.S. after 1939. Family lore has it that this was due to his thick German accent, and that is probably true, but I can’t help but think that it was also because his resume was unappealing to U.S. employers, Leo having spent his entire professional career with a Nazi-friendly company. My great-grandma Margaret was Jewish. I mean, come on. Look at the cup in this undated photograph of my great-grandpa Leo. My great-grandpa Leo was quite possibly the least hateful person who ever walked the planet. So many people who knew and loved him describe his gentle, kind, funny, loving nature. He took his family all over the world, including to some of the very places that our current president deems to be “shithole countries” and he made friends everywhere he went. Great-grandpa Leo’s long-time friend, Capt. Frederich Buch (founder of our Winkie tradition) is on record as having defied the Nazis in 1939, the same year that Leo’s all-access passes appear to have dried up. Here is the relevant passage from Martin Goldsmith’s Alex’s Wake: A Voyage of Betrayal and a Journey of Remembrance (Da Capo Press, April 8, 2014) describing Captain Buch’s removal from the St. Louis in February 1939. My theory (and that’s all it is, at this point, as I have much more research to do) is that 1939 was probably the year Great-grandpa Leo either resigned in solidarity with Capt. 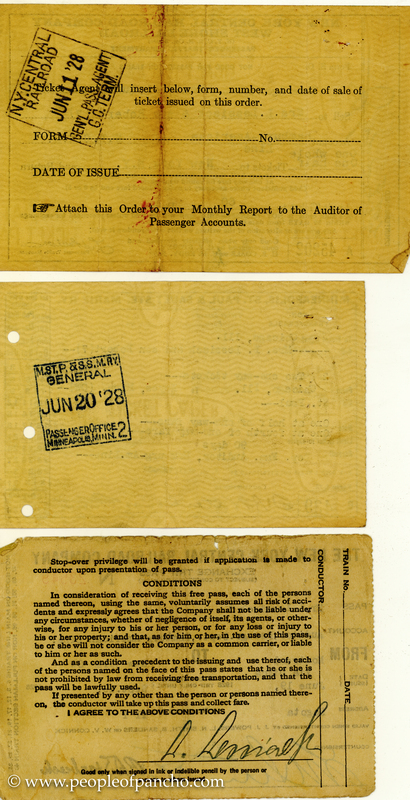 Buch, or was dismissed from the Hamburg-Amerika Line, possibly because his spouse was Jewish. Mind you, he and my Great-grandma Margaret both became naturalized U.S. citizens in 1925, so they were no longer German citizens. 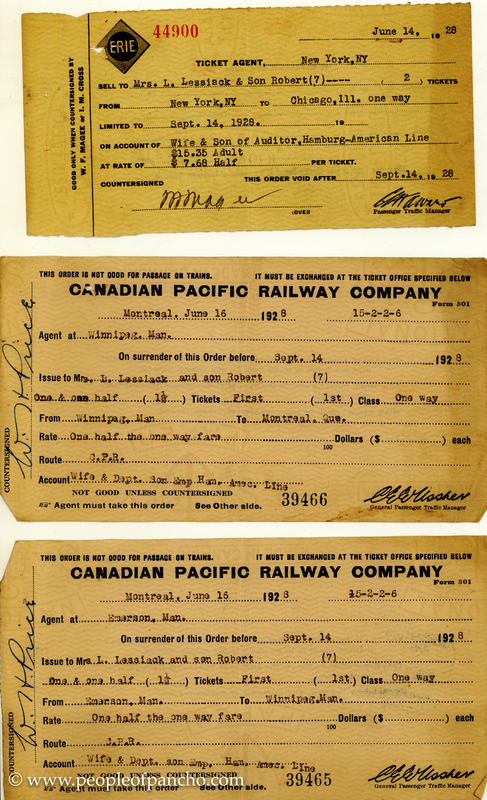 He also registered for the U.S. WWII draft in April of 1942, when he was 51 years old (! ), and as I have already mentioned, my Grandpa Bob served as an officer in the United States Marine Corps reserves in the Pacific. With that necessary Hamburg-Amerika Line information behind us, let us return to happier artifacts of Great-grandpa Leo at work. He clearly loved his job, and his colleagues clearly loved him back, as subsequent posts will show. Unfortunately, now I am forced to wonder who, if any, among these many smiling faces might have been Nazi sympathizers. I’m reasonably sure my great-grandpa Leo, my Jewish great-grandmother Margaret Spielmann Lessiack, and their dear friend friend Capt. Frederich Buch were not among them, but gosh, in what close proximity they came to unspeakable evil. 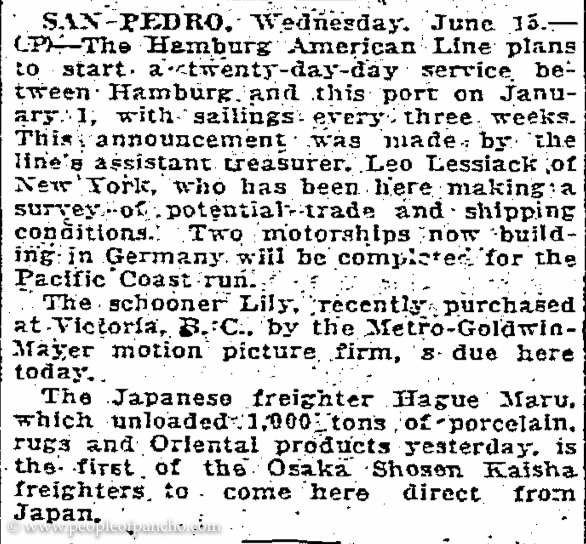 “The Hamburg-Amerika Line outing, Midland Park, S.I., August 20, 1927.” Capt. Buch and Great-grandpa Leo are in the back row, toward the middle. Special thanks to my husband who performed Photoshop magic to stitch this image together for me, as I had to scan it in segments. The actual paper photo is more than two feet long! 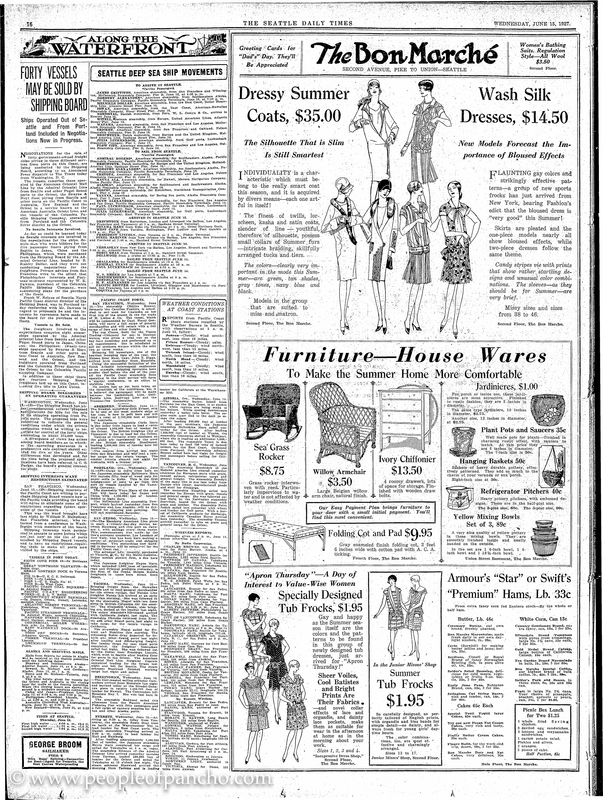 A page from the June 15, 1927 edition of The Seattle Daily Times, in which Leo was quoted (zoomed in below). In a future post, I’ll show pictures that I think are related to the above-mentioned schooner Lily and Great-grandpa Leo’s travels in Hollywood. They’re fun. Dang, Panch. This post has me wowed!!! What is so exciting to watch as you weave this history together is how gratifying this is/will be to all of Leo’s descendants and friends. Unfortunately, I’m at work at our model ship school out by Summit, and the wifi is horrible so all that has downloaded is the script. I think I’ve got all the script, but no illustrations. I’ll get it all when I get home. One question: was Bob a reservist during WWII or active duty? The way you wrote that sentence makes it sound as if he were a reservist at the time he served in the Pacific. I think he was active duty when he and Kathy were married. In fact, I think I heard he was either a Lt. Colonel or a full Colonel when he retired (or resigned) from the reserves, but a lieutenant when he was here in active duty. We’ll have to ask you mom. Possibly your research indicates he was a reservist called to active duty during the war. It’s a small point, but caught my interest because there is a distinction. You’re such a wonderful writer. Again, I’m so moved by today’s post. Thank you. Mostly, I think Leo thanks you. Thanks, Lew. Everything I have indicates that Grandpa Bob was a reservist called up for active duty during the war, but I haven’t examined the whole record in detail, except to look for clues on permission to marry the mysterious Dorrie. He was definitely on active duty when he and Grandma Kathi were married, and he did retire from the reserves quite high up. I will dig more deeply into all of that in later posts. Very difficult post to write. Beautifully done, as always. What a powerful post. It doesn’t sound like Leo would have been a Nazi sympathizer. What happened to your great-grandmother’s family? Were they still in Germany? 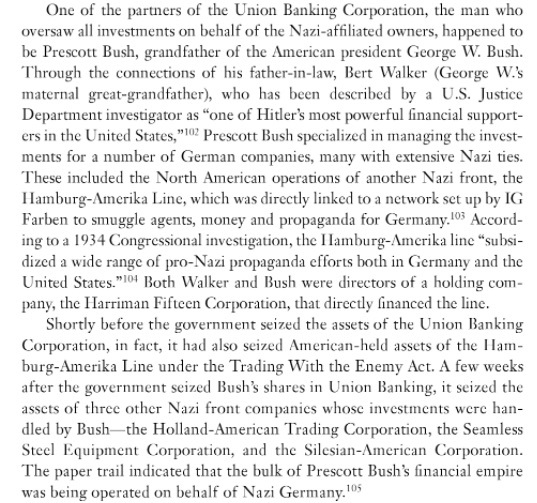 I am more troubled by how Prescott Bush was entangled in all the Nazi companies. Why hadn’t I heard about this during the elections of his son and grandson? Not that it would be fair to visit the sins of the father on his son and grandson, but was this even publicly known and discussed? Wow. I am with you on MAGA (though it took me a while to decipher the acronym—maybe you’d better let your great-great-grandchildren know what it means!). I think those of us who study family history and history in general know that at some point our own ancestors faced discrimination, poverty, oppression—and needed the support of the community and a sanctuary to escape to. It’s sad that Leo lost a job he loved, but I like to think that he was glad to be done with that company. I know nothing about Margaret’s family back in Europe, unfortunately. I plan to dig into that one day. All I have to go on are the names I found in the temple records from Vienna, and that’s pretty slim pickings. However, more Jewish records come online all the time, so I hope there will be more to go on when I get around to it. I can’t imagine that the news is very good, though. I found the Bush and Walker family connections rather shocking myself, though I was very familiar with Ford and Lindbergh’s miserable beliefs. Amazing to me that those two are presented as heroes to American schoolchildren to this day. Yes, Ford and Lindberg were both despicable. That I knew—but the Bush information was quite a revelation. So your great-grandmother was from Austria? There must be some records, I’d think. So those are Margaret’s parents, right? And they both were Spielmanns even before marriage? Interesting! Yes, distant cousins, I surmise. I’m told this was not uncommon among Jews in Eastern Europe trying to marry within the faith. Yes, I’ve seen all kinds of cousins marrying in my tree—including my great-grandparents who were supposedly first cousins. As Amy says, a powerful post. It certainly doesn’t seem that Leo was a Nazi sympathiser, and it must have been so difficult for him to work amongst people who were. We can’t choose our colleagues, and it is never easy to be the one to speak out against a culture of evil — or acquiesce towards it. Very true, Su. The whole situation must have been so difficult for him. Great read and super interesting- found my readers! Panchi, I haven’t commented because I honestly haven’t known what to say. I know what you mean. I know his heart was pure and loving. He and Capt. Buch were honorable men. As someone else observed, we can’t always pick our colleagues, nor have the luxury of throwing away a long career with a company. He had many fond ties to Germany, and he did not have the benefit of perfect hindsight that we have today. I’m sure Hamburg-America’s Nazi connection haunted him. More to come on this topic in future posts. This entry was posted on January 15, 2018 by Pancho in Lessiack People, Spielmann People and tagged 28 Broadway, Franz Georg Leopold Lessiack, Hamburg-Amerika Line, Hamburg-Amerika Linie, Mt. Tamalpais, Muir Woods, United American Lines.